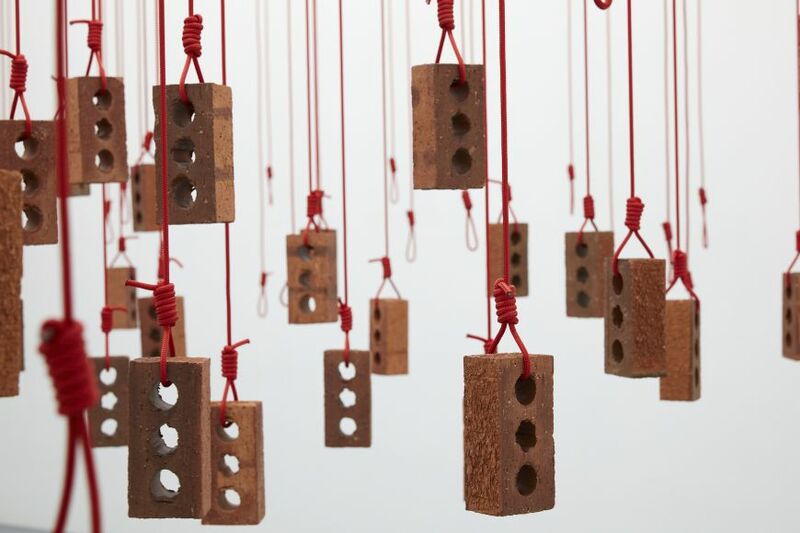 Kendell Geers was born into a working class Afrikaans family during the height of Apartheid. Growing up in the explosive, politically-charged landscape of a crime against humanity, Geers’ youth was haunted with the realisation that his moral, spiritual, and cultural education had all been based on racist lies. In response he ran away from home at age fifteen and set about giving birth to himself, transforming the subjective self into a work of art, starting with changing his date of birth to May 1968. 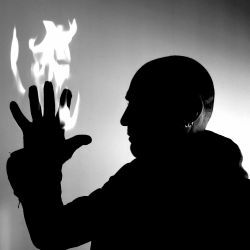 A European by descent, an African by birth, Kendell Geers’s work embodies the contradictions of his identity, being both an African Animist, a European Mystic and Socio-Political Activist. He uses his identity as a key to unlock and critique our understanding and readings of history, art, and language with humour, irony and contradiction. “I remember, as a young artist, going [to the Market Theatre Gallery] to see plays like Asinamali (Mbongeni Ngema) or Woza Albert! (by Ngema, Percy Mtwa, and Barney Simon) in which the political content of the shows was explosive and extreme, but more important to my young imagination was the economy of means: the props were absolutely pared down to their bare essence,” he told Okwui Enwezor and William Kentridge. This inspired him to develop an artistic practice that used simplicity and moral ambiguity and to challenge perceptions. 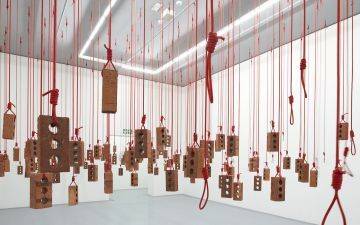 In this new-found vocabulary, broken bottles, bricks, razor-wire, electric fencing and other everyday objects became the active protagonists in a much larger narrative, one that existed beyond the confines of the white cube. He transformed the discourse of Marcel Duchamp’s “Found Object” into what he called “Lost Objects” by which ethics and aesthetics become flip sides of the same cultural coin spinning on the tables of political history. In 1988 (the same year the artist produced seminal Lost Object works like Brick, Suitcase, and Counting Out Song) Geers actively participated in the ‘End Conscription Campaign,’ publicly refusing to be drafted into the South African Defence Force. In order to escape conscription and a consequent six-year prison sentence, he exiled himself in November, first to London as a refugee, then New York, to work full time as Richard Prince’s assistant. Following the release of Nelson Mandela in 1990, he returned to South Africa to help build the new democracy as a curator, journalist, and artist. At the height of the precarious period of political transition, in the run-up to the 1994 elections, Geers joined every single political party in an era when many people were executed for belonging to just one party. This performance and its implicit declaration of democratic freedom of expression is characteristic of Geers’ life and artistic practice, a radical conceptual artist, creating work with a varied practice that challenges and embodies linguistic structures, lost objects, performative elements and film to question and disrupt socially accepted norms and behaviour. Since 2003 his work has taken a more spiritual turn, focusing on environmental issues, population growth, as well as crime and terror within local and global context(s). Notable solo exhibitions include: AfroPunk at the Rodolphe Janssen Gallery and Didier Claes Gallery (Brussels: 2017); ProPaganDaDa at AND Galeria (Barcelona, Spain: 2016) Crossing the Line at the Stephen Friedmann Gallery (London, UK: 2014); SeaSonSinHell at Gallery ACB (Budapest, Hungary: 2015) Ani/Mystik/AKtivist at the Goodman Gallery (Cape Town 2014); Kendell Geers 1988 – 2013 at Hause de Kunst (Munich, Germany: 2013); Songs of Innocence and Experience at Goodman Gallery (Johannesburg, South Africa: 2012); and Irrespectiv at SMAK Ghent (Baltic Newcastle, MAC Lyon: 2007). Participation in group shows includes: Documenta (2017 and 2002); the Venice Biennial (2017 and 2007); Shanghai Biennale (2016); Punk. Its Traces in Contemporary Art at MACBA (Barcelona: 2016); Contemporary Art from the Centre Pompidou at Haus der Kunst (Munich: 2016); INSERT 2014 at Indira Gandhi National Centre for the Arts (Delhi: 2014); The Luminous Interval at the Guggenheim Museum (Bilbao: 2011); and the Bienal de São Paulo (2010).